What will it take to make America a better, stronger, truer country? asks the bestselling author, former Knicks star, and onetime presidential candidate. 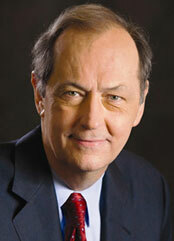 Bill Bradley believes that America is at a teachable moment when we are compelled to reevaluate our political system, our leadership, our agenda as a nation, and ourselves as citizens. With clarity and urgency, Bradley shows why the story we are being told now about who we are as a people is not true. He then offers a new story about our nation, based on America’s rich heritage and his belief in the character of the American people. Bradley explores what changes need to be made in our parties, in our politics, and in citizen activism to ensure America’s future. He asserts that the American people are ready for the truth and suggests that the party that chooses to embrace this new story will be in power for a generation. Writing from his own experience in politics and drawing on his knowledge of history, Bradley shows how the Republican Party has built a solid pyramid structure since the 1970s, at the base of which are money, ideas, and media, whereas the Democratic Party’s structure is an inverted pyramid, with too much emphasis put on the need for a charismatic leader to hold the pyramid up. Each party, for different reasons, fails to deal with the real issues that now confront America. This informed and inspiring call to action is addressed not only to the parties and elected leaders, but to citizens as well. 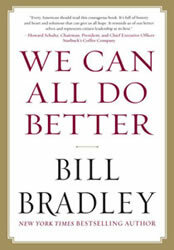 Bradley proposes things every American can do to shape our nation’s future. He points out that if eighty percent of the electorate voted, instead of fifty percent, it would be the most important change in American politics since women got the vote. Now more than ever, he says, we need to embrace an “ethic of connectedness,” a combination of collective action and individual responsibility, to solve our nation’s most pressing problems, and he argues that the fate of all countries is bound together as never before. Writing today with the freedom of a private citizen, Bradley provides this transformative and eye-opening book about the danger and the promise of America’s choice at this crucial moment in the nation’s history. Taking advantage of his long and varied experience — and the credibility he earns because he’s not running for office — Bradley appeals to Americans’ better nature in a bid to recast politics. Lamenting the current cynicism that has divided the nation into red and blue states, Bradley aims to counter the conventional wisdom that the nation lacks the resources or the will to tackle problems. Recounting past national glories, Bradley proposes a new American story that focuses on the realities, not scare tactics or rosy political spin. He offers a specific agenda to help the U.S. find a place in the world that is not determined by military might but by a “civil religion” that works to improve common conditions for all nations. The current focus on the war in Iraq has distracted the U.S. from attending to growing tensions between Japan and China, the rise of anti-Americanism in South America, and the proliferation of nuclear weapons, among a host of other crucial developments. On the domestic front, Bradley advocates health care for every American, higher teacher salaries, lower employment taxes, and publicly funded congressional and presidential elections, among other policies. Bradley appeals to both Democrats and Republicans — and individual citizens — to seize the current moment to reshape the nation’s direction. Bradley, former professional basketball player, U.S. senator, and presidential candidate, offers a thoughtful look at American politics for citizens of whatever political persuasion. — From Booklist — Vanessa Bush – Copyright © American Library Association. All rights reserved.